Sips n Strokes - Auburn, August Calendar is Out! The August 2009 Calendar is now online for the Auburn location. Sips n Strokes BHM - August 2009 Calendars Are Now Online! The August 2009 Calendars are now online for all Sips n Strokes Locations. Please note that the following locations will have Children Art Classes in August on Saturdays 10:00AM – 12:00PM. The Auburn location is inviting all educators to come for a fun Summer night at Sips n Strokes. All educators can bring their school ID's and receive $5 off at check in. No coupon needed, just bring your school ID. All educators are welcome, from grade schools to college! Discount will be taken at check in, no other coupons excepted. Some restrictions apply. $5.00 off classes and bring a friend free on kids classes. We are running some special $5.00 off classes with no coupon needed. See below for the dates and locations. The discount will be applied at check in. No coupons will be accepted. Some restrictions apply. Also for the rest of the month all Saturday kids classes at Trussville and Vestavia are bring a friend for free. So go to www.sipsnstrokes.com and register for two kids for the price of one. The discount will be applied at check in. No coupons will be accepted. Some restrictions apply. You can click on the images below to take you online and register. Two of the paintings for Sips n Strokes Tuscaloosa have been changed for this week. Tomorrow, July the 9th, the painting has been changed to a fun, colorful cross! 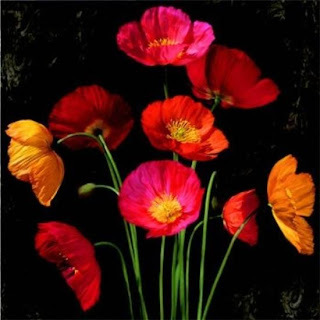 Saturday, July the 11th, the painting has been changed to a lively poppy picture! Be sure to reserve your seat today so that we can show you to a wonderful and exciting Sips n Strokes evening. We look forward to seeing you this week!